Coverage is still pouring in surrounding our story that 5,000 festive fatties were ditched from BeautifulPeople.com for indulging in a mince pie too many over the festive season. 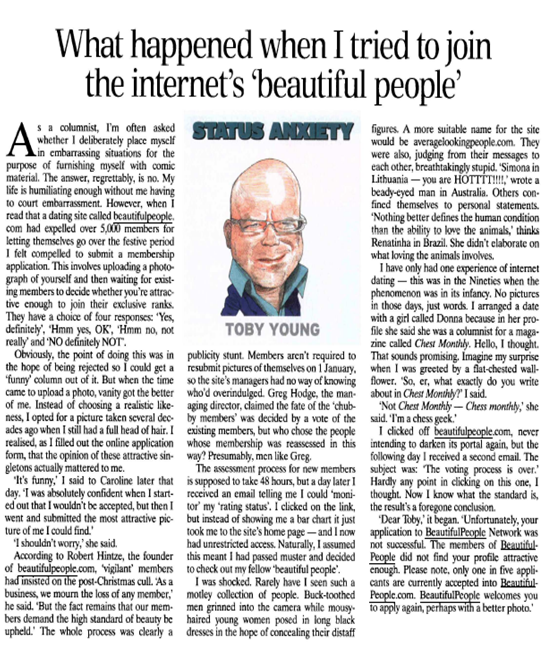 Japan, Russia and New Zealand are the latest to file the news, while back home in the UK, BeautifulPeople.com continues to be a hit with the tabloids. Stories have been appearing alongside the scantily clad blondes gracing the pages of the Star and the Sun and wait a minute…news is just in that we have reached the highbrow read that is the Spectator, the educated man’s answer to heat magazine. We were excited to read that Toby Young, the Spectator’s revered columnist had a good root around the site – even though he didn’t get voted on. Some cynics could say that his review of the site could be tinged with sour grapes, but we thought it was so brilliant that we had to share it anyway.